Desire to pursue higher education should not be extinguished due to lack of either funding or the college preparation that makes students better candidates for college acceptance. Over the years, The 100 Black Men of Chicago, Inc has invested considerable effort towards closing the achievement gap in academics between African American youth and their peers in other ethnic groups. Our college prep initiatives address the quality and quantity of information, resources, and tools available to youth. We have provided free ACT/SAT practice exams, reduced priced exam prep courses, college campus visitation, workshops on preparing for, and funding a college education. In addition, we host the largest College Scholarship Fair targeting African American and Latino students in the Midwest, drawing busloads of students from as far as Detroit, Milwaukee, Rockford, Indianapolis, and St. Louis. CBS (Chicago) — New and returning students at Walter H. Dyett High School for the Arts received an enthusiastic welcome from some unexpected guests on the first day of school. Bobby Burke, a member of 100 Black Men of Chicago, said he experienced an “adrenaline rush” as he high-fived and cheered for students arriving at Dyett. He grew up in Robert Taylor Homes public housing and in his twenties made a decision to, as he says, “figure out” what he wanted to do in life. He has been with his current company for 20 years. Years ago, when guest speakers visited Burke’s high school to discuss college and careers, he noticed he often did not see them again. He said 100 Black Men of Chicago makes ongoing efforts to engage with young people and show them anything is possible. “Every day you have the potential to wake up and pursue your dreams and change your environment,” he said. “Seeing these gentlemen was huge,” said Janella Curtis whose daughter, freshman Nichali Hoskin, is new to Dyett this year. 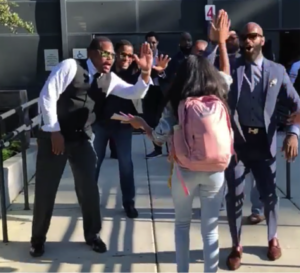 Curtis captured a video of her daughter high-fiving the men as she entered school. Cheering students on is part of Burke’s lifelong commitment to actively participate in young people’s lives. “You put in the work so they see it,” said Burke.